Hedychium or ginger lilies are part of Zingerberaceae family. They are easy to grow so long as you provide them with what they want. What they like is a moist soil and a shadier position. When planted in full sun in a dry soil the plant looks pretty miserable often curling its leaves until the sun passes over. Hedychiums will grow into more impressive specimens if they are left undisturbed. Because of this ginger lilies are a good buffer plant to have between established permanent plants and the transitional summer plantings. Partially shaded areas are ideal. Along with giving the plant the shade it requires the soil is also less likely to dry out. Keep them away from any particularly thirsty, established members of the garden. Hedychiums come from areas of the world experiencing monsoon conditions. It will be necessary to water these plants throughout the season even once established to achieve the most luxuriant growth. As these plants will be left in the soil for more than one season it is important to plant them in a rich soil. Prepare an area larger than necessary with plenty of composted manure and come made compost. 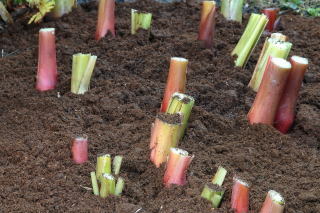 By preparing a larger area of soil, the expanding rhizomes will have some where nice to grow into. 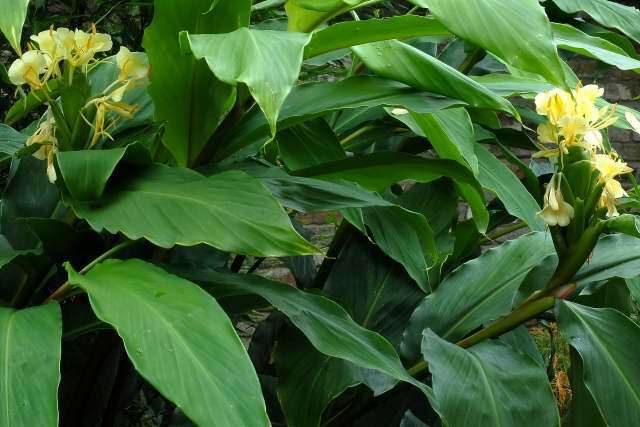 Although there are some similarities between the foliage of ginger lilies and canna plants, the flowers are totally different. Flowers on hedychiums vary a lot in size between the different varieties but all of them posses a strong (but pleasant) fragrance. 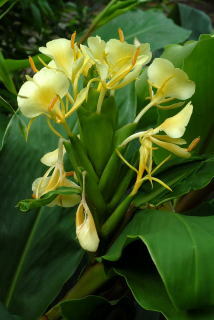 The most widely grown variety of hedychium is hedychium gardnerianum (Kahili ginger). It is considered by many to be the most beautiful of the gingers producing a 1½ - 2 foot flower spike on top of 6 foot stems. One advantage of hedychiums over some other varieties of ginger such as the Alpinia's is that they will produce flowers, in most cases, on this years growth. Some of the taller varieties will not achieve flowers in areas with shorter summers, but most of the more widely available varieties will, having been selected for just this reason. This prevents the need to move potted plants in and out of the greenhouse in order to experience the flowers. 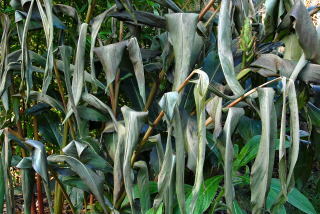 Although the roots of gingers are quite hardy the foliage soon turns to mush with the first hard frost. After the first frosts, trim the stems to the ground using secateurs. By leaving a reasonable bit of stem on the plant you will still be able to locate where the plants are after they have been mulched. This prevents slicing through the colony by mistake (and any ensuing depression) the following spring. Pull up any weeds that may have established amongst the rhizomes. 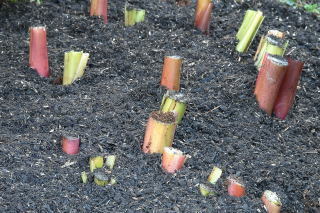 Ginger rhizomes have the habit of rising to the surface so it is important to give them a good thick mulch. Use a weed-seed free mulch for this. Spread a good layer of composted farm manure over the rhizomes to provide the plants nourishment for next season. Finally spread a layer of ground and composted bark over the top for extra, low cost, insulation. The hedychium rhizomes are now ready for the worst that winter (in a zone 9 garden) and the neighbourhood cats, can throw atthem. 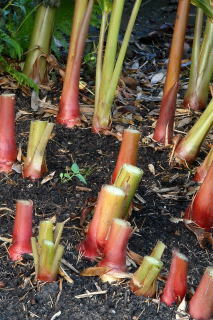 In the spring secure a sheet of clear plastic over the soil where your hedychium rhizomes are slumbering. This helps to warm the soil and wake up the plants. As always using this method, keep an eye on the weather forecasts. Once the plants begin growing make sure you have a protective layer of fleece or blanket to protect the emerging stems if frost is predicted. If your colony has become congested, it can be dug up in February divided and replanted. See below. To follow the progress of Hedychium gardnerianum from seed to flower have a look here.